The RIDGID® Model RT1400 professional wet dry vac is a 14-gallon 6.0 peak HP industrial-strength wet dry vacuum with a cart to conquer rough jobsite terrain. It features a large capacity and the rugged construction needed for pro, contractor and industrial use. 11.5 Amp Motor - Durable, long-lasting motor backs industry’s best warranty. 2-Stage Motor - Creates powerful high-lift suction and more efficient air flow. Oversized Drain - Large drain located at the lowest point of the drum for emptying of water. Sturdy Cart, Push Handle and Large Rear Wheels - These features act together to allow the vac to travel easily up/down stairs and over rough terrain and thresholds. Sound Reduction Technology - Scroll Noise Reduction® is a patented feature that provides quiet operation by precisely controlling the flow of air through the vac. Professional Locking Hose - The ultra-flexible hose won’t pull loose during use, and is four times more durable than our standard hose. This 1-7/8” x 8’ hose has a smooth interior surface to reduce clogging. 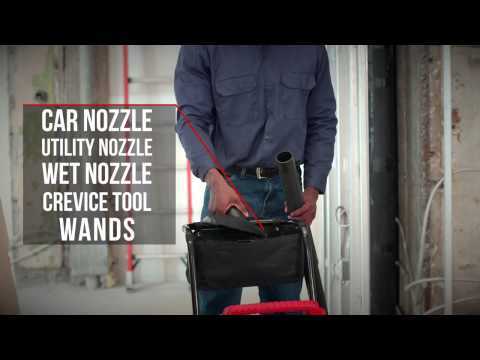 Includes - Vacuum, owner's manual, 2 extension wands, 1-7/8” x 8’ premium locking pro hose, utility nozzle, wet nozzle, crevice tool, car nozzle and fine dust filter. 14 Gallon Wet/Dry Vac with Cart is rated 4.8 out of 5 by 40. Rated 4 out of 5 by JnEFlooring from Very good vacuum for the money! Good HP for suction. Only flaw for my uses is the OEM hose is a little short for what I use it for. Had to buy another one that was longer. The plastic piece that holds the attachments is virtually useless cause the attachments don't stay in it. But, performance wise it is a good vacuum for the price point and only time will tell the lifespan of it. I have only had it 2 weeks. I wish the cashier at Home Depot would've offered a extended warranty cause I always get them on tools. Unfortunately, I was in a hurry and forgot but had she offered it I would of bought it on this item. Rated 5 out of 5 by Perry1430 from Great deal! Included hose and car tools are great! Relitivly powerful and quiet. Rated 5 out of 5 by Mr1Fixit from So far it's great So far i'ts great. It did pick about 30 marbles my son dropped in the toilet. rather than trying to flush them or better yet me trying to get them out with my hand. Rated 5 out of 5 by DblD from Excellent Value I’m very impressed with the wet/dry vac. The power is strong. I used it to clean a fire pit and it was actually sucking up the river rock (rocks are bigger than the hose opening). Another nice feature is the tool bar that keeps all your fittings organized. Truly impressed with this unit. Rated 5 out of 5 by Gort from Lotta bang for the buck! The addition of the automotive vacuum kit makes this a great deal! Rated 5 out of 5 by whitethunder from Ridgid shop vac The Ridgid line of tools is very sharp looking and visually well designed. However , the shop vacs are the only tools I will ever buy again from Ridgid. If you are just a weekend warrior or maybe the biggest DIY project you will attempt is a new deck , then the tools might be fine. As far as medium duty tools go, you can do much better. The shop vacs seem to be the exception. I have had three of them and they have all done yeomen s work. What is the actual sound level in dB when this is in use? What is the static water lift?